At Bridges of Hope, we deal with a wide variety of situations, and we try to find not only appropriate but also creative solutions for families who sometimes are facing some unique situations. Sandy is a mother of two boys: Nathan (age 7) and Kyle (age 4). Sandy was struggling to find productive activities and healthy outlets for the boys who both have serious mental health diagnoses. Sandy had been utilizing Respite Services once or twice a month, but she was wondering what she could do to provide an activity for the times when they were together as a family. That was when Sandy was connected with Bridges of Hope. A staff member met with Sandy and then took the information back to the entire team. As staff pondered Sandy’s story and her concerns, slowly the idea to build a sandbox began to form. 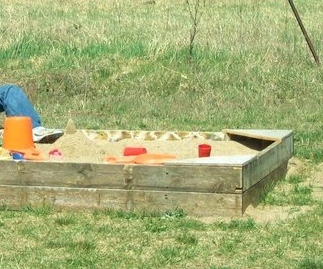 A sandbox would provide the boys an active outlet for their ADHD and other mental health issues. Bridges of Hope was able to utilize its Just For Kids fund to assist with purchasing wood, sand, and other materials needed to build the sandbox. A few weeks later, when the Bridges staff followed up with Sandy, she reported that she had made building the sandbox into a family project, and it was already getting lots of use every day. Sandy said both boys loved the sandbox, and it was a real benefit to have something for the boys to do outside together. Over the past ten years, we have encountered many different family situations. Some happen more commonly for families: cars break down, someone loses a job, a plan for daycare falls through, or there simply just isn’t enough money to pay all the bills. Others, like Sandy’s situation, have happened only once or twice: gophers chew through wiring, a toddler is sneaking out of the house at night, two boys need a healthy outlet for their extra energy. Whatever the situation, Bridges of Hope seeks to look at each individual family’s story as its own unique situation, and we tailor our services, suggestions and resources to best fit that family’s needs. Bridges was founded on this idea: to simply be the bridge between families and those with the resources to help families. That means the bridge might look different for different families, but that’s the whole idea: that each family is different, and a one-size-fits all solution simply doesn’t work in every case. For Sandy, her solution was a sandbox. The next time for another family it might be help with a water bill. Or referrals to a housing program. Or help setting up Respite Services to provide a break for a parent. Each time, for each family, we work to connect families with the resources that best fit them, right in the situation they’re in, given the strengths and needs they have at the time. In that way, we are able to constantly adapt our services to best meet the needs of each person who reaches out for support. And that’s what it’s all about: helping in creative ways to build bridges. Learn more about Bridges of Hope’s services, or refer a family in need to us. Read other stories about how we are helping families connect to resources. Make a donation to support our work with a family. Contact us to make sure we know about the services you provide in our community.